To prevent melted ice cream from leaking out of the pointy bottom of a cone, plug the hole up with a marshmallow before adding any ice cream on top. This will also give you a nice treat when you're almost finished, as the marshmallow will absorb some of the ice cream. Or, if you like the flat-bottomed cake cones, you can cut a hole out of a paper plate (or a coffee filter) and use that as a drip-catcher when you're eating your ice cream on a hot summer day. To prevent ice crystals from forming on your ice cream when it's in the freezer, place the carton inside of a ziplock bag first before freezing. It'll help keep your ice cream safe from any change in temperature that can result in ice crystals forming. Serving ice cream to a lot of people at a party? Scoop single-serving portions within individual slots of a muffin tin tray and place in the freezer or large ice box before dishing them out. To make serving even easier, put them in either silicone muffin cups or cupcake liners inside the tin. Didn't think that far ahead? If you're ice cream is in a cardboard container, you can just use a knife to slice out individual servings. 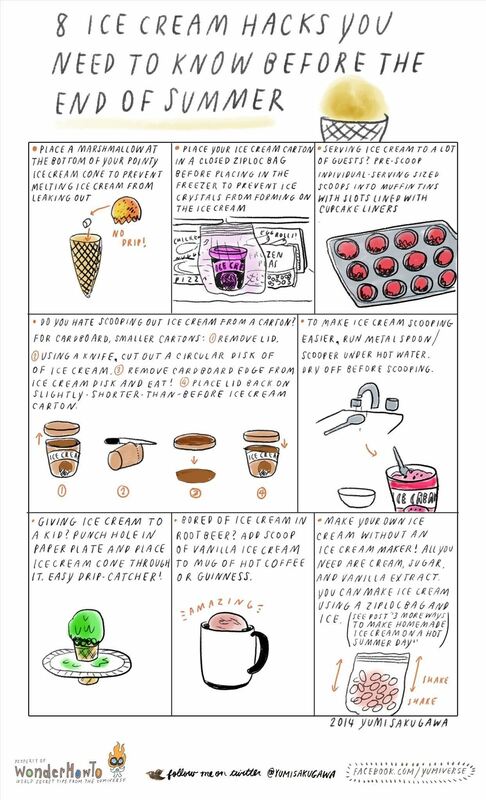 Also, there is no ice cream hack like making your own ice cream—without a trip to the freezer aisle or your local ice cream parlor. Check out my past guides on making homemade ice cream using empty coffee cans, using ziplock bags and ice, or using dry ice.